Board books are a brilliant invention: bright and colorful; small; just a few pages with just a few words; sturdy to withstand baby teeth and drool; providing tactile experience via textures and buttons and flaps and cutouts; they are the ultimate toy. There are a few board books at home that both the kids find it hard to let go even after they have well-outgrown the reading level and subject matter. In the spirit of Children's Book Week 2014, I wanted to share these beloved board books here, some of which are just random impulse picks that were heavily marked down for sale. Despite wondering the reasons for the markdown, I am glad for those spur-of-the-moment decisions that brought these much-loved books home and are now deeply entrenched in the kids' minds and their bookshelves. "Squeak Squeak! Zebra's proud because he stands out in a crowd." "Squeak! Squeak! Hear lion roar. Eats his lunch and still wants more!" This particular "Tap My Nose" book was a huge hit with both the kids. A giant soft black pushable button becomes an animal's nose on each page. Kids get to tap/push it to make a squeaking noise. And, each page has a simple rhyming couplet and large stark colorful image of the animal. Ble mae'r mochyn pinc yn cuddio? Ydy e tu ôl i'r glustog? [Where is the pink pig hiding? This lift-the-flap book was/is a fond favorite with all of us. Even if the kids are ready to give it away, I don't think I'll ever be. "Where's the _(toy)__ hiding?" is the ongoing theme in Amser Gwely. Each page asks that questions. Lift the flap to reveal the hidden toy - possibly behind the cushion, behind the curtain, behind the clock and so on. The last page is the best part in Bedtime Peekaboo: "Where have all the toys gone?" "Are they hiding under the blanket?" Lifting the blanket-flap reveals all the toys cuddling in bed, waiting for baby to join them for a night of restful sleep. Amser gwely was the most favorite at bedtime, naturally; and Gwisgo i fyny was perfect for playtime. Gwysgo i fyny asks "Where is the baby hiding?" "Is he behind the red cape?" Shows a baby's features peeking out of a rich red cape a la Superman's. Lift the flap to reveal the baby dressed up as Superman! Winona Whale, Polly Pufferfish, Clark T. Shark, Wally Fuss et al help children learn about colors in the undersea habitat. I am Winona Whale, and I have a big tail. It helps me swim under the sea. With sea horses in their nursery. Along with Smile-o-saurus and Look At Me, we got this book, See the Sea, from grand aunt K. Short, crisp, rhyming verses, bright colorful full page spreads, plus the biggest attraction: Large Wiggly Eyes that form the eyes of the animals in each page with cut-outs to accommodate this feature. I spy a turtle and a little spoon. I spy an elephant and a zebra truck. I Spy books are hugely popular in our house. I like that the books challenge the children enough to spot the items but is not too frustrating as some other similar books. These sturdy board books were chewed on and drooled over and yet stood up to the treatment. One reason I liked them: some of the items in the pictures were vintage and rustic, evoking a slight nostalgia for a bygone era filled with solid wooden toys and an uncomplicated life. A complaint I've heard from some parents is that the pictures are mostly toys and are not of real animals which can be confusing for the little ones. Kids liked them for the rhyming couplets and the clear photographs that provide the clues for items to find: stark white background for the text along with a picture of the animal to find on one half; and the jumble of items on the other half cleverly concealing the current animal/object to find. 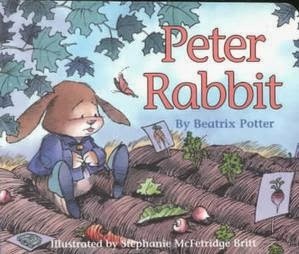 Though I love Beatrix Potter's original watercolor illustrations, I happened upon this book by accident and read it to my toddler first. Initially, I did rephrase in real time, mainly interpreting the pictures as I "read" the story out loud, but, over time, this book somehow became a firm favorite with both the kids at about pre-school age. Illustrations by Ms.Britt are quite charming and complement Ms. Potter's story well. Am sure every parent has a potty-training/conditioning story to tell. Whether it worked or not, this was a favorite book with the toddler, along with Everyone Poops by Taro Gomi. A gentle book, with a very direct message, urging kids to eliminate in the allotted spot. Like the classic Brown Bear, Brown Bear by the duo, these two books seem hard to part and has been on our bookshelf for about 7 years now, with at least another 7 years of stay reserved. Panda Bear book introduces a set of endangered animals, while the Polar Bear book deviates a bit from "What do you see?" format to ask, "What do you hear?" thus introducing the wild animal sounds to the kids. 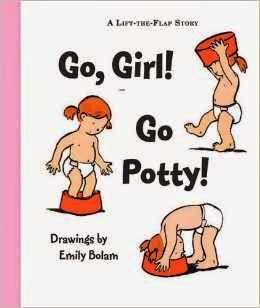 This is one of the books that the preschooler read to her toddler brother over and over much to both their glee. And, after 7 years of inspiring the older child, the book received its ultimate tribute when the then 8 year old decided to make a bilingual English/Spanish version of this book - with Eric Carle-inspired collage and lift-the-flap pages - featuring her own set of animals and event progression, as a present for her brother's 5th birthday. 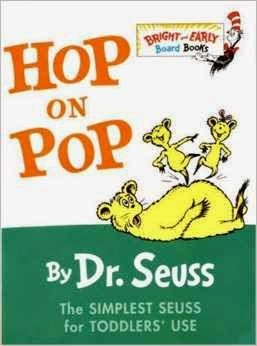 I'd venture a wild guess that there is at least one Dr.Seuss book that every adult today, who grew up with Seuss, holds dear and would not part with. This little board book, thanks to the rhyme and repetition of sounds, plus the characteristic pictures, carried the right level of interest and challenge for reading for the kids when they were preschoolers. SAY SAY What does this say? Ask me tomorrow but not today. Growing up fluent in a couple of different Indian languages, it seems natural for me to mix a few of my native words into English as I speak - to make up new words which is a wild amalgamation of words from 2 or 3 languages. Wanting the same pleasure for my kids, we settled on this book to help us weave in some Welsh words into our English conversations, along with the few Tamil words that I managed to impart. 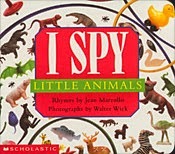 Though not quite the smallish board book, this rather heavy large hardcover has clear, colorful pictures of things/people/animals with the Welsh words for them grouped under Colors, Toys, Farm Animals, Mealtime, Bedtime, and so on. The toughest part was to figure out the pronunciation. But we had help: Papa speaks Welsh so we learnt to say the words correctly close enough. Another random purchase at a famous Mylapore store, this book has traveled to three countries with the younger child. The fascination is that, rather than the traditional construction vehicles in many books found in the U.S., this book has auto rickshaw and bullock cart and tram which seem exotic in today's context.